Massey, Montague: Recollections of Calcutta for over half a century. -- Calcutta : Thacker, Spink & Co., 1918. -- xviii, 144 S. : Ill. ; 21 cm. -- Online: http://www.archive.org/details/recollectionsofc00massiala. -- Zugriff am 2008-06-20. -- "Not in copyright"
Calcutta (Kālīkātā).—Capital of the Indian Empire and the official residence of the Viceroy and Governor-General, situated in 22° 34' N. and 88° 22' E., on the east or left bank of the Hooghly river, within the Twenty-four Parganas District, Bengal. The city lies about 86 miles from the sea, and is only 18 to 21 feet above mean sea-level. Stretching northward for 6 miles along the river-bank, and bounded on the east by the Circular Canal and the Salt Lakes, it covers at the present day an area of 20,547 acres, of which only 1,792 are rural, and 1,113 acres form the Maidān. Calcutta is so called after a village which formerly occupied the site of the modern Bow Bazar : the name is supposed by some to be connected with the worship of the goddess Kālī. The city is bounded on all sides by suburban municipalities, which [S. 261] have been excluded from Calcutta for purposes of municipal administration. Cossipore-Chitpur on the north, Māniktala on the east, and Garden Reach on the south-west, as well as Howrah on the west bank of the Hooghly river, are industrial suburbs, which form an integral part of the life of the metropolis. If these be included, Calcutta has a population of 1,106,738, which is greater than that of any European city except London, Constantinople, Paris, and Berlin, and of any city in America except New York, Chicago, and Philadelphia. 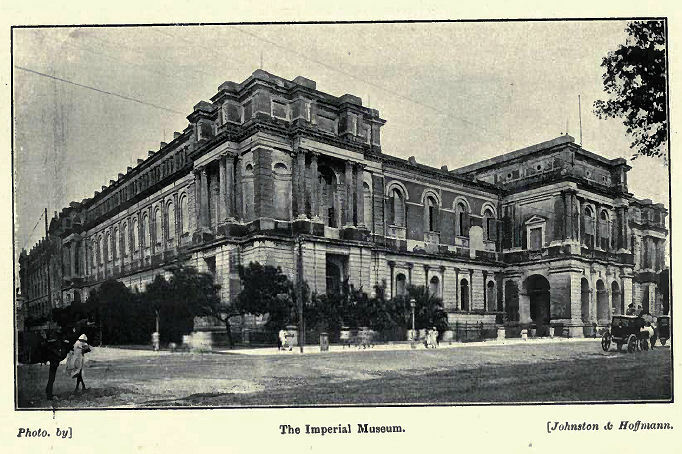 Excluding China, the population of whose cities is uncertain, the only city in Asia with more inhabitants than Calcutta is Tokio ; and next to London, it is the most populous city in the British Empire. The present article is, however, confined to the municipal town of Calcutta as defined in Bengal Act III of 1899, Fort William, and the water area, the population of which (1901) is 808,969, 4,612, and 34,215 respectively. The importance of Calcutta lies in its position as the capital of the empire and as a seaport situated on a navigable river and connected by converging lines of railway, rivers, navigable canals, and roads with the rich valleys of the Ganges and Brahmaputra, whose produce it exports oversea, while it supplies their dense population with the products and manufactures of other countries. In the centre of the town stands Fort William, surrounded by the noble expanse of park known as the Maidān. North of this are the shops and business houses of the Europeans, whose residential quarter bounds it on the east. To the south and south-east lie the European suburbs of Ballygunge and Alipore, which latter contains the residence of the Lieutenant-Governor of Bengal. Surrounding the European quarter on all sides is the native town. 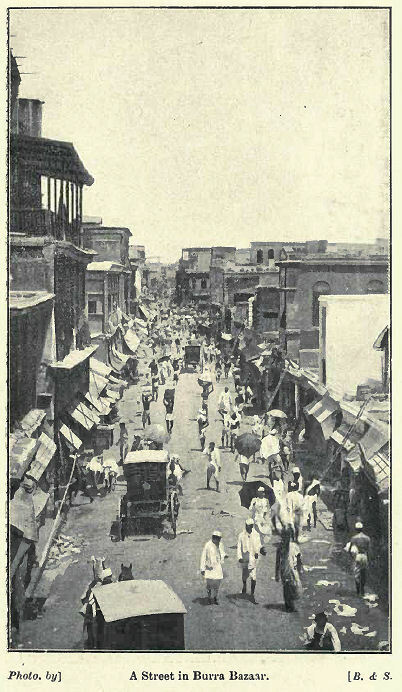 Immediately north of the European commercial quarter is Burra Bazar, the chief centre of native business ; the buildings are mainly one-storeyed masonry shops, and it is only here and in the adjoining quarters of Jorābāgān and Bow Bazar that brick buildings are more numerous than tiled huts. Three-fifths of the whole population live in the latter, which have mud or wattle walls and are known as kachcha houses. The native town is traversed by three main roads from north to south, and by five or six roads from east to west, but with these exceptions it is extremely ill-arranged. The lanes are narrow, tortuous, and badly lit ; the dwellings are overcrowded and insanitary ; and the overwhelming proportion of one-storeyed houses gives this portion of the town a peculiarly squalid appearance which belies the proud title of a 'city of palaces' which Calcutta claims. The city of Calcutta includes the area under the control of the municipal corporation, or Calcutta proper, together with Fort William and the Maidān (1,283 acres), which are under the military authorities, and the water area, or port and canals, with an area of 7,310 acres. Calcutta [S. 262] proper again is divided into the 'Old Town' and the 'Added Area.' The former, which covers 3,766 acres, is divided into eighteen wards, and is situated between the Lower Circular Road and the Hooghly river. This is the tract within the old Marāthā Ditch, corresponding with the original civil jurisdiction of the Sadar Diwāni Adālat. The 'Added Area' lies south and east of the Old Town, and is separated from it by the Circular Road; it contains 8,188 acres, distributed over eleven wards. It was excluded from the Suburban municipality and added to Calcutta by Bengal Act II of 1888. The soil on which Calcutta is built has been formed at a comparatively recent date by the alluvial deposits of the Gangetic delta, and excavations made for tanks and foundations disclose alternate layers of sand and clay. A bore-hole sunk in Fort William in 1840 revealed an ancient land surface at a depth of 382 feet. The climate is hot and moist. The mean temperature averages 79°, the mean maximum being 102° in May and the mean minimum 48° in January. The average temperature in the hot season is 85°, in the rains 83°, and in the cold season 72°. Humidity averages 78 per cent. of saturation, ranging from 69 per cent. in March to 89 per cent. in August. The annual rainfall averages 60 inches, and the average number of rainy days in the year is 118. At the beginning and close of the rainy season Calcutta is frequently visited by cyclones, the most disastrous having occurred in 1737, 1842, 1864, and 1867. In 1737 the steeple of St. Anne's Church fell to the ground, many houses were blown down, and all but one of the ships in the river were driven ashore. 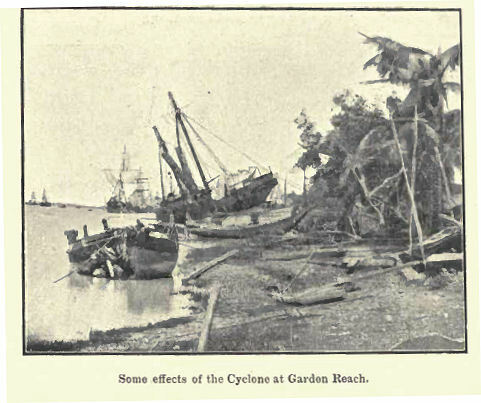 In the cyclone of 1864 as many as 49 persons were killed and 16 injured; several brick houses were destroyed or damaged, and only 23 of the 195 vessels in the port escaped without injury. The earthquake of June 12, 1897, was severely felt in Calcutta; the steeple of the Cathedral was destroyed and 1,300 houses were injured. Calcutta is mentioned in a poem of 1495 as a village on the bank of the Hooghly. When the Portuguese began to frequent the river about 1530, Sātgaon, not far from Hooghly on the old Saraswatī river, was the great emporium of trade. 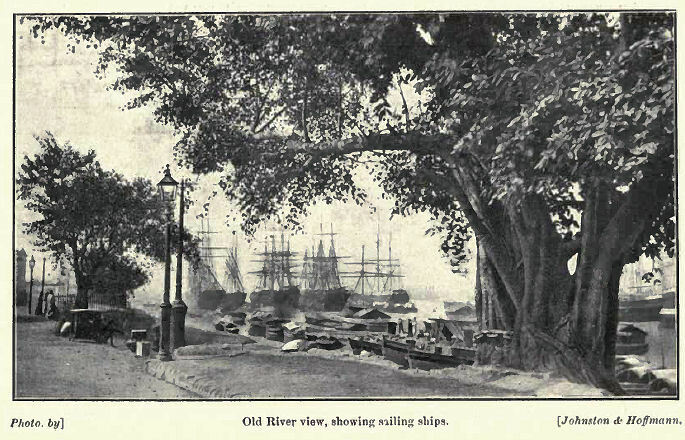 Owing to the shallowness of the upper reaches of the river, however, ships used to anchor at Garden Reach, and their goods were sent up to Sātgaon in small boats ; and a market thus sprang up at Betor, near Sibpur, on the west bank of the Hooghly, which the Portuguese made their head-quarters. In the sixteenth century the Saraswatī began to silt up, and Sātgaon was abandoned. Most of its inhabitants went to the town of Hooghly, but about the middle of the century four families of Bysakhs and one of Seths founded the village of Gobindpur on the site of the modern Fort William. Shortly after this the Portuguese moved [S. 263] to Hooghly, deserting Betor, and the trade of the latter place was gradually transferred to Sūtānuti ('cotton mart') in the north of modern Calcutta. Job Charnock of the English East India Company came to this place in 1686, after his skirmish with the Mughals at Hooghly, and formulated certain demands on the Nawāb. These were rejected by the latter, who ordered his subordinates to drive the English out of the country. Charnock retaliated by destroying the salt-houses and forts at Tāna or Garden Reach and seizing Hijilī. He was shortly afterwards superseded by Captain Heath, who came out from England with instructions to occupy Chittagong. The attempt on this place failed ; but on August 24, 1690, the English returned to Sūtānuti under Charnock, at the invitation of the Nawāb, and laid the foundation of modern Calcutta. 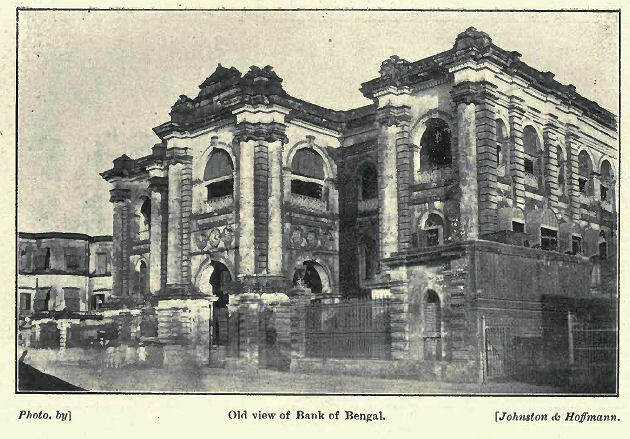 Several reasons led to the selection of this place as the head-quarters of British trade in Bengal. The Hooghly river tapped the rich trade of the Ganges valley, and Calcutta was situated at the highest point at which the river was navigable for sea-going vessels ; it was moreover protected against attack by the river on the west and by morasses on the east, and it could be defended by the guns of the shipping. In 1696 the rebellion of Subha Singh, a Burdwān zamīndār, assumed formidable dimensions, and the English applied to the Nawāb for permission to fortify their settlement. This was granted ; and a fort was constructed on a site extending from the modern Fairlie Place on the north to Koila Ghāt Street on the south, the river forming the western and what is now Dalhousie Square the eastern boundary. It was completed in 1702. Four years previously the three villages of Calcutta, Sūtnuti, and Gobindpur had been purchased from the governor of Hooghly. The town grew rapidly ; within a short time a wharf, a good hospital, a church, and barracks were erected; and in 1707 the East India Company declared it a separate Presidency accountable only to the Directors in London. The new settlement was perpetually harassed by the Muhammadan governors of Bengal; and in 1717 the Council sent an embassy to Delhi to procure the recognition of their rights in the country and permission to purchase property on the banks of the Hooghly. The emperor granted the permission sought for, but it was to a great extent rendered nugatory by the determined opposition of the Nawāb. In 1742 the inhabitants commenced to dig an entrenchment round their settlement as a defence against the Marāthās, who were then raiding Bengal. This entrenchment, known as the Marāthā Ditch, followed the course of the modern Circular Road, but it was never completed along the southern boundary. The scare caused by the Marāthā invasion and the growing trade of the Company brought a large influx of new settlers, and in 1752 Holwell calculated the population at [S. 264] 409,000, though this was probably an over-estimate, as the number of houses was still less than 15,000. The original settlement round the Fort was protected by palisades ; but the Company's servants lived in the quarter now bounded by Canning Street on the north, Hastings Street on the south, Mission Row on the east, and the river on the west. Within this area there were in 1753, exclusive of the Fort and its warehouses, no less than 230 masonry structures, and the native portion of the town contained about the same number. The chief event in the early history of Calcutta is its capture in 1756 by Sirāj-ud-daula, Nawāb of Bengal. The native troops deserted and the Europeans were driven into the fort, which was practically indefensible, as its guns were masked by the surrounding buildings. The Governor and many of the officials made their escape to the ships, which thereupon dropped down the river, and the garrison, under the command of Holwell, were driven to surrender. They were forced, to the number of 146, into a small room, measuring only 18 by 14 feet, which is known in history as the Black Hole. Here they were left for the night. It was June 20 ; the heat was intense, and the two small grated windows were quite insufficient to give air to the closely packed crowd, who endured terrible sufferings. When the morning came and the door was opened, only twenty-three were found alive. The town was recaptured by Clive and Admiral Watson early in 1757 ; and after the battle of Plassey, Mīr Jafar gave the English the zamīndāri of the Twenty-four Parganas, as well as a free gift of the town and some of the adjacent villages. Heavy compensation was paid to the merchants and the Company's servants and adherents for their losses, and permission was granted to establish a mint. From this date the town has enjoyed uninterrupted prosperity. With part of the compensation money received from the Nawāb, Gobindpur was cleared of its inhabitants and the foundations of the present fort were laid. It was not finished till 1773, and is said to have cost two millions sterling, half a million of which was spent on works to protect the west face from the erosion of the river. The clearing of the jungle round the fort led to the formation of the Maidān. In 1766 the General Hospital was removed to its present site, and at this period the European quarter began to extend southwards along Chowringhee. In 1773, by an Act of Parliament, the Governor and Council of Bengal were invested with control over the other Indian possessions of the Company, and soon afterwards Warren Hastings removed the treasury from Murshidābād to Calcutta. By a statute of George III Justices of the Peace were appointed for the town in 1794, and regular assessments were authorized. The Circular Road was metalled, and the conservancy establishment was increased. But many defects remained ; and in 1803 Lord Wellesley pointed out the extremely defective construction of the public drains and watercourses, the absence of any regulations in respect of the situation of public markets and slaughter-houses, the irregularity of the buildings and the dangerous condition of the streets, and appointed a Town Improvement Committee of 30 members to carry out the necessary reforms. Since 1793 it had been the practice to raise money for public improvements by means of lotteries, 10 per cent. of their value being set aside for public works or charitable purposes. As long as the Town Improvement Committee existed, these funds were made over to it ; but in 1817 a Lottery Committee was formed, which was employed for twenty years in schemes for the improvement of the town. During this period a great advance was, undoubtedly made. 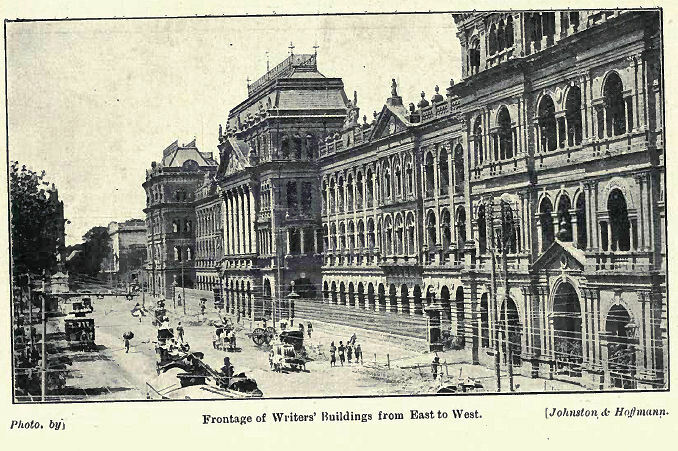 The Town Hall was built and the Beliāghāta canal dug, and a large number of streets were opened out, including the Strand Road, Amherst Street, Colootolla and Mirzapur Streets, Free School Street, Kyd Street, Canal Road, Mango Lane, and Bentinck Street, and the long roadway formed by Cornwallis Street, College Street, Wellington Street, and Wellesley Street, with the four adjoining squares. Arrangements for watering the streets were also introduced. In 1820 a systematic plan for road-metalling was adopted at an annual cost of Rs. 25,000. Public opinion [S. 266] in England having condemned this method of providing funds for municipal purposes, the Lottery Committee came to an end in 1836. Meanwhile, under the Act of 1794, the Justices had met the expenses of the conservancy and police of the town from a tax on houses and licences for the sale of liquor. In 18 19 the house tax realized a little over 2½ lakhs, and in 1836 this had risen to 3 lakhs, while 1½ lakhs was derived from excise. The expenditure on conservancy and police was at this period 5¼ lakhs, the difference being made up by Government. In 1810 the principle of municipal taxation was extended to the suburbs. In 1840 an Act was passed dividing Calcutta into four divisions, and authorizing the ratepayers, on an application made by two-thirds of them, to undertake their own assessment, collection, and management of the rates up to a limit of 5 per cent. on the assessable property in Calcutta. Nothing came of this Act, and in 1847 the Justices were replaced by a Board of seven paid members, four of whom were to be elected by the ratepayers. They were empowered to purchase and hold property for the improvement of Calcutta and to make surveys, and were entrusted with the maintenance of the streets and drainage. In 1852 their number was reduced to four, two being appointed by Government and two elected ; and they were allowed a maximum salary of Rs. 250 a month. The house tax was raised first to 6¼ per cent. and later to 7½ per cent., and a 2 per cent. lighting rate and a tax on carts were authorized ; horses and vehicles had already been made taxable by the Act of 1847. The Commissioners were required to set aside 1½ lakhs for the sewage and drainage of the town. In 1856 their number was reduced to three, all of whom were appointed by the Lieutenant-Governor. In 1863 the municipal government was vested in a body composed of all the Justices of the Peace for the town of Calcutta, together with all the Justices for the Province who happened to be resident in the town. This body elected its own vice-chairman and had a regular health officer, engineer, surveyor, tax-collector, and assessor. A water rate was imposed, and the house tax raised to a maximum of 10 per cent. The Justices' powers of borrowing were extended by several Acts, and during their period of office the drainage and water system of the town were largely developed. The municipal slaughter-houses were opened in 1866, and the New Market in 1874. Footpaths were made along the main thoroughfares, Beadon Square was opened, and in all about 2 crores were spent on the improvement of the town. In 1876 a new corporation was created, consisting of 72 commissioners with a chairman and vice-chairman ; 48 of the commissioners were elected by the ratepayers and 24 appointed by the Local Government. [S. 267] This body completed the original drainage scheme, largely increased the supply of filtered and unfiltered water, and effected many other improvements, including the construction of the Harrison Road. In 1888 the municipal boundaries were extended by the inclusion of a large portion of the suburbs lying south and east of the Circular Road. Seven wards were added, and additions were made to three other wards in the north of the city. The number of municipal commissioners was raised to 75, of whom 50 were elected, 15 appointed by Government, and the remaining 10 nominated by the Chamber of Commerce, the Trades Association, and the Port Commissioners. During the following ten years the filtered water-supply was further extended, at a cost of 18 lakhs, and an underground drainage scheme for the 'Added Area' was started. A dhobikhānā, or laundry, and an incinerator were constructed, and a number of insanitary tanks were filled up and replaced by roads and squares. This constitution remained unaltered until 1900, when it was replaced by the system of municipal government now in force, which will be described farther on. The population of Calcutta in 1901 was 847,796, the mean density being 41 persons per acre for the whole city, and 68 in Calcutta proper. By far the most crowded ward is Colootolla with 281 persons to the acre, followed by Jorāsānko (202), Jorābāgān (201), and Moocheepāra (199); these wards are in the centre of the native commercial quarter. The lowest density occurs in the suburbs of Alipore and Ballygunge, where much land is still not built over. The greatest increase in population during the last decade has occurred in the wards which were already most populous in 1891. Judged by European standards, the city is seriously overcrowded ; more than half the population have less than half a room per head, and 90 per cent. have three-quarters of a room or less. In Burra Bazar no less than 9,531 persons out of 31,574 are crowded four or more into each room. Calcutta in normal years is fairly healthy, but of late the mortality has been greatly swollen by the plague, which in 1903 accounted for 8,222 deaths out of a total of 29,765 ; the other chief diseases are fever, dysentery, cholera, and respiratory complaints. Early estimates of the population were made from time to time, but they were partial and untrustworthy, and it was not until 1876 that the first complete Census was taken. The population then enumerated for the whole area of modern Calcutta was 611,784, which grew to 612,307 in 1881, to 682,305 in 1891, and to 847,796 in 1901. On the last two occasions the increases have amounted to 11 and 24 per cent. respectively. Only a third of the population of Calcutta in 1901 had been born there : half had been born in other parts of Bengal and one-seventh in [S. 268] other parts of India. The number of persons born in other countries in Asia is 2,973, in Europe 6,701, in Africa 96, in America 175, in Australia 80, and at sea 9. Of the number born in other parts of Bengal, the Twenty-four Parganas supplies nearly one-fifth, and large numbers come from Hooghly, Gayā, Patna, Midnapore, and Cuttack. Of those from other parts of British India, the majority are recruited from the United Provinces, chiefly from Benares, Azamgarh, Ghāzīpur, and Jaunpur. Of other Asiatics, the Chinese, who congregate in China Bazar and the Bow Bazar and Waterloo Street sections, account for 1,709, of whom only 141 are females. Of those born in Europe, 5,750 are British and 951 come from other countries, France (176), Germany (168), and Austria (108) alone having more than 100 representatives. In the whole population there are only half as many women as men. This is due to the large number of immigrants, among whom there are only 279 females to 1,000 males ; the majority of these are temporary settlers who leave their families at home. Another result of the large volume of immigration is that 44 per cent. of the entire population are male adults, which is double the proportion for the whole of Bengal. No less than 57 different languages are spoken by people living in Calcutta, of which 41 are Asiatic and 16 non-Asiatic. The Bengali-speaking population numbers 435,000 and the Hindi-speaking 319,000. About 31,000 persons speak Oriya, 29,000 English, and 24,000 Urdu. By religion 65 per cent. are Hindus, 29-4 per cent. Muhammadans, and 4 per cent. Christians, leaving only about 1 per cent. for all other religions combined; the latter include 2,903 Buddhists, 1,889 Jews and 1,799 Brahmos. Hindus preponderate in the north of the city, while the chief Musalman centres are Colootolla and Moocheepāra, and the outlying wards near the docks and canals. During the decade ending 1901 the growth of the Christian population was 31 per cent. The number of native Christians during the same period increased from 6,671 to 9,872, or by 49 per cent., the Roman Catholic missions with a gain of 88 per cent. being the most successful. The chief Protestant bodies are the Church Missionary Society, the Oxford Mission, the Baptist Mission, the London Mission, the Episcopal Methodist Mission, and the missions of the Established and Free Churches of Scotland. Besides direct evangelization, most of the missions maintain schools and colleges, and thus promote the cause of higher education. Nearly a third of the inhabitants of Calcutta are engaged in manufactures, and nearly a fourth in trade, while personal service accounts for a sixth. Assuming that a man does not begin to work until fifteen years of age, it would appear that no less than 96 per cent. of the males above that age are actual workers ; the corresponding proportion in the case of women is only 32. The industrial population is most numerous in Colootolla, Moocheepāra, Jorāsānko, Bhawānīpur, Intally, and Beniāpukur, while Jorāsānko, Burra Bazar, and Jorābāgān wards have the greatest number of persons engaged in commerce. The professional element is strongest in Burtolla in the north, and in Bhawānīpur in the south of the city. Calcutta itself contains but few factories, only three jute-mills and two jute-presses lying within its limits. In the outskirts of the city, however, several smaller industrial concerns are situated, including 63 oil-mills chiefly worked by cattle, 24 flour-mills, 2 rice-mills, 16 iron foundries, and 12 tanneries, which employ less than 13,000 persons all told. 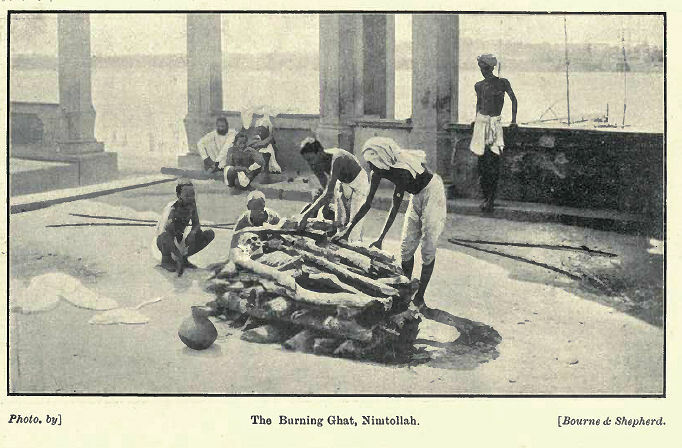 The chief home industries are pottery and brasswork ; but Calcutta exports little of its own manufactures, and it is to commerce that it mainly owes its position. The demand for Indian muslins gradually died out in Europe, while early in the nineteenth century Lancashire began to export manufactured cotton goods to India, and the introduction of steam-power placed the local weavers at such a disadvantage that piece-goods are now by far the largest article of import into Bengal, while the export of silk and cotton manufactures has practically ceased. The export of jute, on the other hand, has grown enormously since the middle of the nineteenth century, and the production of oilseeds and tea has vastly increased. Bengal coal is in great demand all over India, and salt and mineral oils are largely imported. Through all these vicissitudes of commerce, Calcutta has more than held its own, and the development of railways and of steamer routes along the main waterways has greatly strengthened its position, so that it now focuses the trade of Assam as well as of Eastern Bengal and of the Gangetic valley. The foreign trade of the port in 1903-4, exclusive of treasure, was valued at 90.54 crores, of which exports amounted to 57.04 crores ; and the coasting trade was valued at 11.61 crores, of which 6.66 crores represented exports. The total value of the sea-borne trade, including treasure, was 112.92 crores. 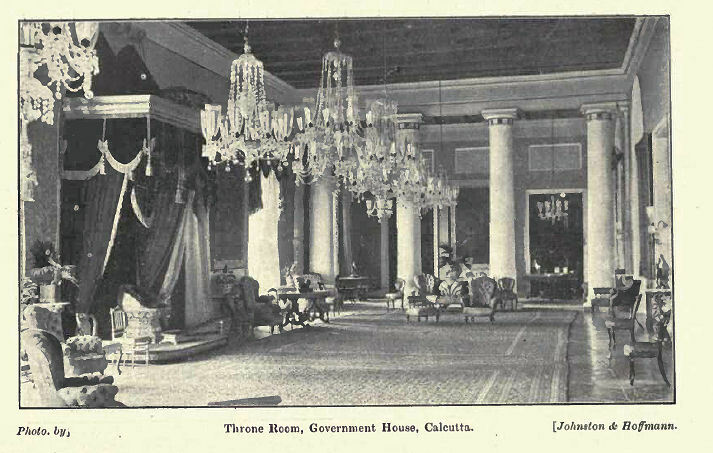 The chief imports into Calcutta are cotton goods, representing in 1903-4 a value of over 16 crores. Next in importance are treasure, metals, oil, sugar, and machinery : and these are followed by woollen goods, hardware and cutlery, salt, liquors, apparel, drugs, and railway material. About seven-eighths (in value) of the imports came from Europe, three-quarters of the whole being from the United Kingdom. The chief exports are raw and manufactured jute, tea, opium, hides and skins, oilseeds, grain and pulses, indigo, lac, raw cotton, coal, raw silk, saltpetre, and oils. The most striking feature in the growth of the export trade has been the enormous increase in the shipments of jute and coal. The exports of jute have risen from 8 crores in 1893-4 to nearly 20 crores in 1903-4, and now form about three-eighths of the outward trade ; while the shipments of [S. 271] coal to foreign ports amounted in 1901 to more than halt a million tons, as against only 8 tons in 1880. During the same period the imports of foreign coal dwindled from 70,000 to 2,000 tons. More than half of the export trade was with European countries, the United Kingdom taking a third of the whole. Of the continental countries Germany took almost as much as all the others combined. The trade with the United States came next to that of the United Kingdom, and China took rather less than Germany. The coasting trade has been influenced considerably by extensions of railway communications, and by the development of direct steamship communications between other Indian ports and abroad. The value of imports in 1903-4 was 504 lakhs, of which 462 lakhs was the value of Indian produce and 32 lakhs of foreign merchandise, while 10 lakhs represented treasure. The exports were valued at 726 lakhs, of which 587 lakhs was the value of Indian produce and 79 lakhs that of foreign merchandise, treasure amounting to 60 lakhs. The chief ports with which the coasting trade is carried on are Rangoon, Moulmein, Akyab, Bombay, and Madras. The imports are cotton goods and salt from Bombay, rice and mineral oil from Burma, and sugar, vegetable oil, and oilseeds from Madras ; and the exports are grain and pulses, coal, jute and gunnies, spices, tobacco, and tea. from Assam, tea, oilseeds, grain and pulses, and lime. In 1901-2 the imports from Bengal were valued at nearly 49 crores. Calcutta being the chief distributing centre of Bengal, the principal articles exported to the interior are the same as those enumerated under the head of foreign imports. The total exports from Calcutta by rail, road, and river were valued in 1903-4 at nearly 38 crores. 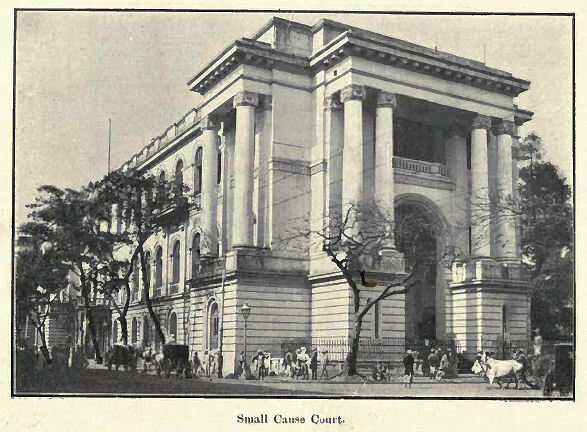 The chief associations connected with the trade and commerce of the city are the Bengal Chamber of Commerce (founded in 1834) with its affiliated societies, and the Royal Exchange, the Bengal Bonded Warehouse Association, the Calcutta Trades Association, and the Bengal National Chamber of Commerce. Three great railways converge on Calcutta. The East Indian Railway connects Calcutta with Bombay, the United Provinces, and the Punjab, and is the outlet for the rich traffic of the Ganges valley. Its terminus is on the west bank of the river at Howrah ; but a branch crosses the Hooghly by a bridge at Naihāti, 25 miles up the river, providing access to the docks at Kidderpore over the Eastern Bengal State Railway. The Bengal-Nagpur Railway runs through Orissa to Madras, and [S. 272] westwards through the Central Provinces to Bombay ; its terminus is also at Howrah, but a wagon ferry plies between Shalimār and the docks. The Eastern Bengal State Railway, the terminus of which is at Sealdah, connects Calcutta with North and East Bengal and Assam, and with Diamond Harbour. The railways, however, by no means monopolize the traffic. Numerous native craft ply up and down the rivers, along the channels through the Sundarbans which connect Calcutta with Eastern Bengal and the valley of the Brahmaputra, and on the Midnapore and Orissa Coast Canals. There are also several large steamer companies, whose vessels navigate these inland waters and carry an extensive coasting trade to the Orissa ports ; the most important of these are the India General, the Calcutta Steam, and the Rivers Steam Navigation Companies. The port was formerly under direct Government management, but in 1870 a Port Trust was formed, consisting at first of 12, and afterwards of 15 commissioners. The Strand Bank lands were subsequently made over to them at an annual quit-rent of Rs. 37,392. The value of the property taken over by the Trust was estimated at 27-65 lakhs, and with further advances the debt was consolidated into a loan of 60 lakhs. During the last thirty years the commissioners have been adding considerably to the facilities of the port. In 1870 there were only 6 screw-pile jetties, 6 cranes, and 4 sheds for the accommodation of the seagoing trade ; whereas now there are 6 unloading berths for seagoing vessels at the jetties, with a frontage of 2,982 feet, and all the loading is done separately at the Kidderpore docks. These docks, which were constructed in 1884-5 at a cost of 285 lakhs, consist of a basin, connected by a double passage with the wet docks, which accommodate twelve vessels, and of two graving docks. The Petroleum Wharf at Budge-Budge was established in 1886, and the Tea Warehouse in 1887. In 1889 the Port Commissioners were made the Conservators of the port. 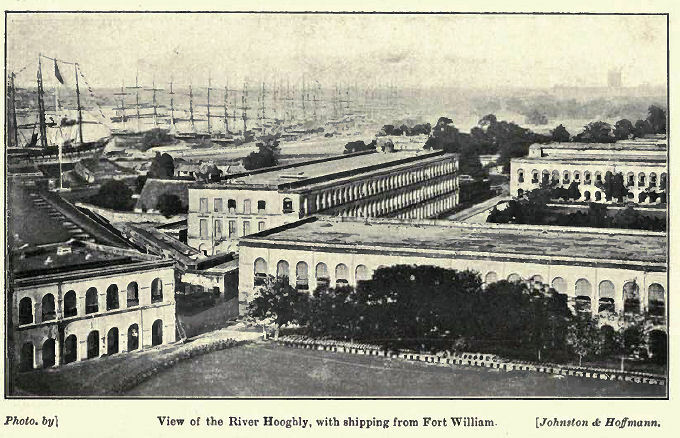 They have their own dockyard and workshop, and they maintain a staff of assistant harbour masters, who take over the pilotage of all vessels from Garden Reach ; they license all cargo boats and pay three-fourths of the cost of the river police ; they survey and prepare charts of the river from Calcutta to the sea, and are responsible for the lighting of the Hooghly. The revenue of the Port Trust amounted in 1903-4 to 80 lakhs, and the expenditure to 77 lakhs. The greater part of the income is derived from a toll of 4 annas a ton on all goods shipped or discharged. The capital debt amounts to 501 lakhs, and the book value of the Trust property is returned at 656 lakhs, exclusive of the Strand Bank and Howrah foreshore lands, and an accumulated sinking fund of 42 lakhs. Even before the foundation of Calcutta, the East India Company [S. 273] had found it necessary to maintain a special staff to guide ships through the difficult channels of the Hooghly. The Pilot Service is now a Government department, consisting in 1903-4 of 58 officers paid by fees. Some account of the action taken from time to time to keep the channels open, and to facilitate navigation, will be found in the article on the Hooghly River. The most noticeable features of recent years are the substitution of steam for sailing vessels, the rapid growth of the coasting trade, and the increase in the size of the vessels visiting the port. In 1886-7 the number of sailing vessels was 465, but in 1903-4 it had dropped to 87, and only 29 of these hailed from foreign ports. During the same period the volume of the coasting trade has grown from 1,410,000 tons to 3,317,000 tons; the average tonnage of vessels engaged in the foreign trade has increased from 1,449 to 2,622 tons, and that of coasting vessels from 881 to 1,679 tons. Up to 1867 only two of the roads in Calcutta were metalled with stone ; but in 1905 there were 300.43 miles of road, of which 117 miles were metalled. The roads are maintained by the Corporation, with the exception of those on the Maidān, which are under the charge of the Public Works department. The city is intersected by four main roads running parallel with the river. The most westerly of these, known as the Strand Road, which has been formed by successive reclamations of the foreshore, skirts the river bank from Hastings to Nimtolla, passing by Fort William, the Eden Gardens, and the Jetties. East of this is the Chowringhee Road with its row of lofty houses facing the Maidān, which a traveller of the eighteenth century described as 'an entire village of palaces.' This road, with its northern continuations, Bentinck Street and the Chitpur Road, occupies the site of the old pilgrim road to Kālī Ghāt; and its southern continuation, known as the Russa Road, is still the route for pilgrims visiting that shrine. Between this and the Lower Circular Road is a street running through the heart of the city, the various sections of which are called [S. 274] Wellesley Street, College Street, and Cornwallis Street ; and to the east of it the Lower Circular Road sweeps round the city, one section of it following the course of the old Marāthā Ditch. 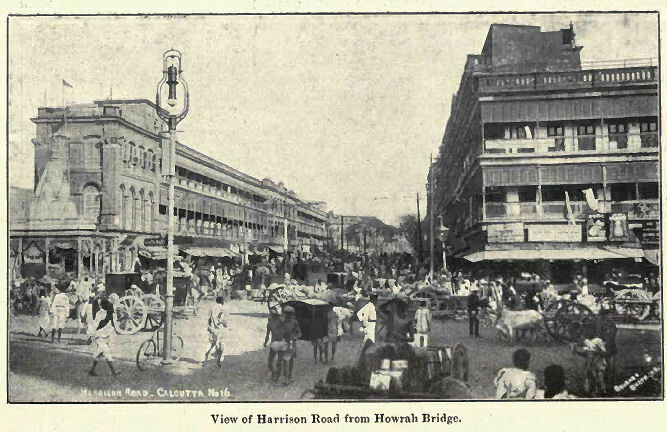 These four main roads are linked by a number of cross streets, the most important of which are Park Street, passing through the European quarter and so called because it originally bordered the spacious garden of Sir Elijah Impey ; Dhurrumtolla Street, passing through a quarter largely inhabited by Eurasians ; Lāl Bazar and its continuation Bow Bazar, in the centre of the native town, presenting a mass of densely packed houses and shops ; Canning Street and Harrison Road, named after Lord Canning and a former chairman of the Corporation ; and, to the north of the town, Sobhā Bazar and Grey Street. 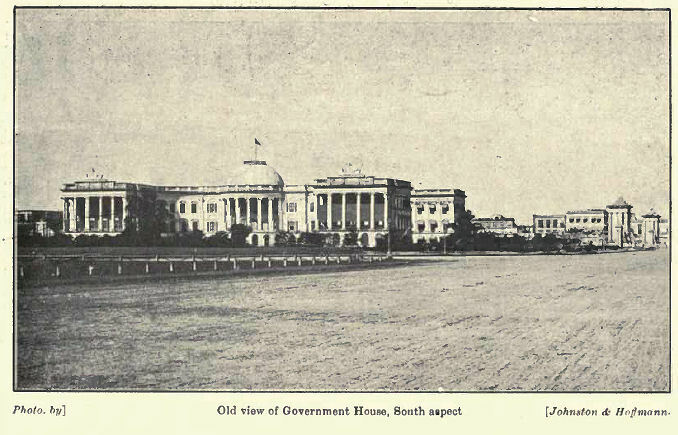 From Government House to Kidderpore, 2 miles to the south, stretches the oldest road in the Maidān, known as the 'Old Course' and described in 1768 as being 'out of town in a sort of angle made to take the air in' ; to the north this road runs into Old Court-house Street, so called from the old court-house pulled down in 1792. Starting from Kidderpore, Garden Reach and Circular Garden Reach Roads connect the docks and the mills fringing the Hooghly with the city, while to the south Diamond Harbour Road links Calcutta with the harbour after which it is named. 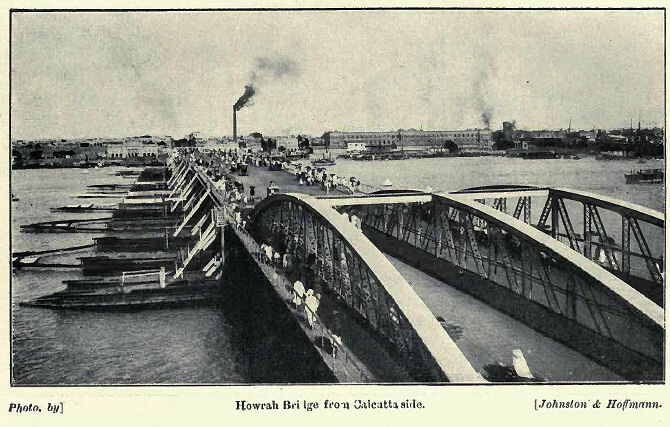 Calcutta is connected with the important town of Howrah, on the west of the river, by several ferries and also by a floating bridge opened in 1874. This structure, supported on pontoons, is 1,530 feet in length between the abutments, and has a roadway for carriages 48 feet in width with footpaths of 7 feet on either side. The bridge is opened three times a week to allow ships to pass to the dockyards above, and while it is open a ferry steamer plies across the river. Bridges over Tolly's Nullah at Kidderpore, Alipore, and Kālī Ghāt connect the south-east portion of the present city with the 'Old Town.' On the north the main roads converge at the Chitpur Bridge, by which the old grand trunk road crosses the Circular canals. Lines of tramway run from the High Court to Tollygunge, Nimtolla Ghāt, and Sealdah, and from the Esplanade to Chitpur, Shām Bazar, Kidderpore, and Belgāchia. These tramways have been recently electrified. There is a large suburban traffic along all the main lines of railway, and also on two small light railways from Howrah to Amtā and Sheakhala. In the 'Old Town' civil justice is administered by a Judge of the High Court, who sits singly and tries cases above Rs. 2,000 in value and suits concerning land ; and by the Small Cause Court with five Judges, who try suits up to Rs. 2,000 in value. In the 'Added Area' a Small Cause Court and two Munsifs' courts sit at Sealdah, and three Munsifs' courts at Alipore ; these are subordinate to the District Judge of the Twenty-four Parganas. Both [S. 275] the District Judge and the Additional Judge of the Twenty-four Parganas have jurisdiction in Calcutta under the Land Acquisition Act. Criminal justice is administered in the 'Old Town' by three stipendiary and a number of honorary Presidency Magistrates. The High Court holds Criminal Sessions, and hears appeals from the Presidency Magistrates. In the 'Added Area' the Sessions Judge and the District Magistrate of the Twenty-four Parganas have criminal jurisdiction. Two stipendiary magistrates sit, one at Alipore and the other at Sealdah, and there are also several honorary magistrates. Throughout Calcutta cases under the Municipal Act are tried by a stipendiary municipal magistrate. The Chief Presidency Magistrate is the presiding officer in the court for the trial of pilots, and also Judge of the Court of Survey for the Port of Calcutta. The Government revenue receipts under the main heads amounted in 1903-4 to 88.5 lakhs, of which Rs. 18,000 was derived from land revenue, 29.7 lakhs from stamps, 33.3 lakhs from excise and opium, and 25.4 lakhs from income-tax. The total revenue receipts in 1880-1, 1890-1, and 1900-1 were 33.5 lakhs, 61.4 lakhs, and 8o.1 lakhs respectively. In 1881 the income-tax had not been imposed. The stamp revenue of Calcutta has risen from 23 lakhs in 1892-3 to 29.7 lakhs in 1903-4, when 14.2 lakhs was realized from judicial and 15.5 lakhs from non-judicial stamps. During the same period the income-tax receipts rose from 17.22 to 25.4 lakhs, in spite of the exclusion from assessment in 1903 of incomes below Rs. 1,000 ; and the excise receipts rose from 25 to 33.3 lakhs. The main items under the latter head are imported liquor (1.5 lakhs), country spirit (19.4 lakhs), opium (4.9 lakhs), hemp drugs (4.3 lakhs), rum (2.3 lakhs), and tāri (Rs. 79,000). In the 'Old Town' there is, strictly speaking, no land revenue, as in 1758 the East India Company obtained from the Nawāb a free grant of the area on which Calcutta now stands. The so-called revenue is really ground-rent, which has been permanently fixed and amounts to Rs. 18,163. The 'Added Area' belongs for revenue purposes to the District of the Twenty-four Parganas. The tract east of Tolly's Nullah and the Lower Circular Road, which comprises Bhawānīpur, [S. 276] Ballygunge, and Intally, is included in the Panchānnagrām Government estate. West of Tolly's Nullah are ordinary permanently settled estates belonging to private owners; a considerable area is, however, included in the Sāhibān Bāgīcha Government estate (see Twenty- four Parganas). The grand total realized by the Customs department in 1903-4 was 388 lakhs, to which salt contributed 197 lakhs; cotton piece-goods, 49½ lakhs: mineral oil, 17½ lakhs; liquor, 22¼ lakhs; articles of food and drink, 12¼ lakhs ; countervailing duties on sugar, 1/3 lakh ; and arms and ammunition, 1¾ lakhs. The export duty on rice amounted to 15¼ lakhs. Besides this, 26 1/3 lakhs was paid into District treasuries on account of salt imported into Calcutta. The municipal administration of the city, as regulated by Bengal Act III of 1899, is in the hands of three co-ordinate authorities, the Corporation, the General Committee, and the Chairman. The Corporation consists of the Chairman appointed by Government, and 50 commissioners, of whom 25 are elected at ward elections, and the remainder are appointed as follows : namely, 4 by the Bengal Chamber of Commerce, 4 by the Calcutta Trades Association, 2 by the Port commissioners, and 15 by the Local Government. The General Committee consists of 1 2 commissioners and the Chairman, who is president. Of the commissioners 4 are elected by the ward commissioners, 4 by the appointed commissioners, and the remaining 4 are appointed by the Local Government. The entire executive power is vested in the Chairman, to be exercised subject to the approval or sanction of the Corporation or General Committee, whenever this is expressly directed in the Act. To the Corporation are reserved the right of fixing the rates of taxation and all those general functions which can be efficiently performed by a large body. The General Committee stands between the deliberative and executive authorities, and deals with those matters which are ill adapted for discussion by the whole Corporation, but yet are too important to be left to the disposal of the Chairman alone. The Corporation thus constituted commenced work in April, 1900 ; and its efforts so far have been mainly directed to the introduction of a continuous water-supply for the whole city, the completion of the drainage scheme, the decentralization of control, and the punctual collection of the rates. The city has been divided into four districts, each with its own staff for conservancy, roads, and buildings. A large scheme for opening out the congested areas, with the assistance of Imperial funds, is under consideration. The drinking-water supply is obtained from the Hooghly river at Paltā, 17 miles north of Calcutta, where it is pumped up into settling tanks and filtered. The pure water is conveyed by gravitation through [S. 277] two iron mains to a masonry reservoir at the north end of the city. Thence it is pumped into the distributing mains and three other reservoirs in different quarters of the city, and from these it is again pumped into the distributing pipes. The scheme was inaugurated in 1860, and it was then intended to supply 6,000,000 gallons per diem, or 15 gallons per head. In recent years the works have been greatly extended, and the Corporation has now three pumping stations at Paltā and four in the city ; there are 1,997 standposts and 5,904 ground hydrants, and the number of filtered water connexions exceeds 26,000. These give to Calcutta and the adjacent towns of Barrackpore, Dum-Dum, Cossipore-Chitpur, Māniktala, and Garden Reach a daily supply of over 7,624,000,000 gallons of filtered water, or 21½ gallons per head. The streets are watered and the drains flushed with unfiltered water pumped up in Calcutta, and for these purposes there are more than 3,500 connexions. The initial cost of the works was 7 lakhs. Subsequent extensions have increased the capital cost to 210 lakhs ; the annual cost of maintenance is 16¾ lakhs. The scheme of underground drainage, by which the city is freed of surplus water and of the filth which water will carry, was inaugurated half a century ago. The drainage is carried eastwards by a series of five parallel conduits which discharge into an intercepting sewer, and thence into a large well at Tengrā in the eastern suburbs. There it is raised by steam pumps into a high-level sewer, which carries it to the Salt Water Lakes, east of the city, there to undergo oxidation. The original project was commenced in 1859, and took sixteen years to complete ; but meanwhile fresh additions had been found necessary, and these are still incomplete so far as the 'Added Area' is concerned. The execution of the original scheme proved a very expensive undertaking and cost the municipality 95 lakhs, including a storm-water cut completed in 1883-4. The annual cost of maintenance amounts to Rs. 26,000. Good progress has been made in lighting the city, especially in the southern area ; oil lamps are being gradually replaced by gas ; and the incandescent system has been extended throughout Calcutta. The Corporation have now 11,000 street lamps, of which 8,500 are gas lamps. A municipal railway conveys street refuse to the Salt Water Lakes. Calcutta possesses many fine buildings, both public and private. 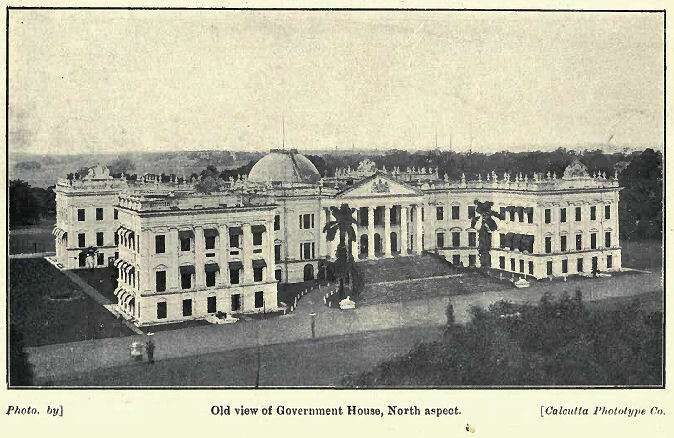 The original Government House occupied the site of the modern Customs Office. The erection of the present building was commenced in 1797 at the instance of the Marquis Wellesley, who urged that 'India should be governed from a palace, not from a counting-house.' It was completed in about seven years at a cost of 13 lakhs. The design was based on that of Kedleston Hall in Derbyshire, the structure consisting of four great wings running to each point of the compass from a central pile approached by a magnificent flight of steps on the north. The Grand Hall is an exceptionally fine chamber, and the building also contains the Council Chamber in which the Supreme Legislature holds its sittings. Various articles of furniture and trophies recall the perilous early days of the Company, having been captured from European or native powers. The two fine full-length portraits of Louis le Bien Aimé and his Queen, together with the chandeliers and twelve busts of the Caesars in the aisles of the Marble Hall, are said to have been taken from a French ship. 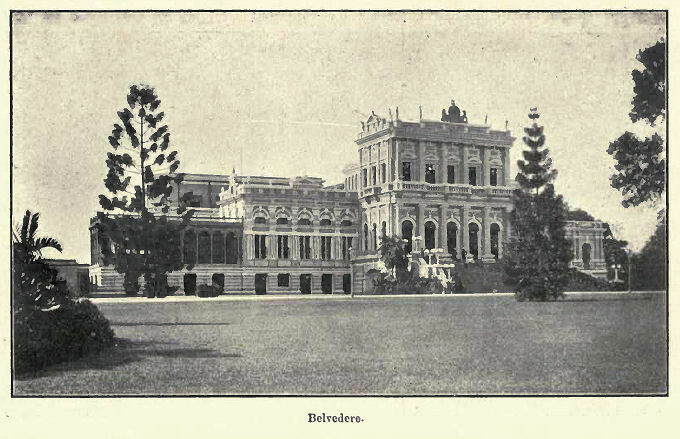 Belvedere, in Alipore, is the official residence of the Lieutenant-Governor of Bengal. Formerly a country-house of Warren Hastings, it was purchased in 1854 for the residence of Sir Frederick Halliday, the first Lieutenant-Governor of Bengal. It is a handsome edifice, and stands in extensive and well-kept grounds. It was greatly improved [S. 279] and embellished by Sir Ashley Eden. At the spot which is now the west entrance of Belvedere, on the Alipore Road, was fought the famous duel between Warren Hastings and Philip Francis, in which the latter was wounded. Not far from this spot is Hastings House, the favourite residence of the great Governor-General, which is now used as a guesthouse for Native chiefs. To the west of Government House, and nearer to the river, stands the High Court. 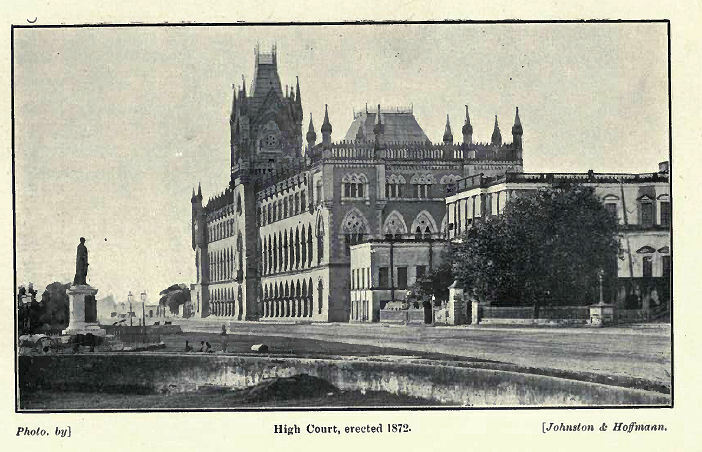 This imposing structure in somewhat florid Gothic was completed in 1872, on the site of the old Supreme Court. The design is said to have been suggested by the Town Hall at Ypres. The Town Hall stands west of Government House, between it and the High Court. It is a large building in the Doric style, approached by a noble flight of steps leading up to the grand portico. It was built in 1804 at a cost of about 7 lakhs, and contains many interesting statues and portraits. The Indian Museum, situated in Chowringhee, contains a fine collection of fossils and minerals, a geological gallery, and a gallery of antiquities. Adjoining it are the Economic Museum and the School of Art. The Mint in the north of the town covers 181 acres, and was built in 1824-30. The style is Doric, the central portico being a copy in half size of the Parthenon at Athens. The Victoria Memorial Hall, which it is proposed to erect in memory of the late Queen-Empress, is now in course of construction at the south end of the Maidān near the Cathedral. The Cathedral Church of the see of Calcutta, St. Paul's, stands at the south-east comer of the Maidān. It was commenced in 1839 and consecrated in 1847, and it is practically the work of Bishop Wilson. 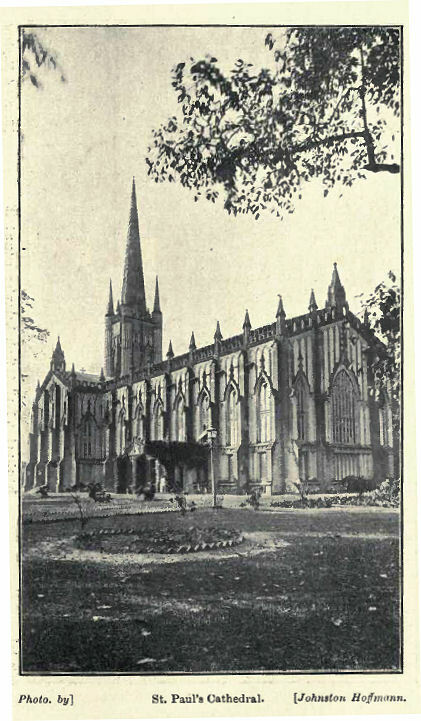 Of the 7½ lakhs raised to build and endow the Cathedral, the Bishop gave 2 lakhs, the East India Company 1½ lakhs, and 2.8 lakhs was subscribed in England ; only Rs. 1,20,000 was collected in India. It is built in a style which is known in Calcutta as Indo-Gothic : that is to say, Gothic adapted by a military engineer to the exigencies of the Indian climate. The building is 247 feet in length with a transept of 114 feet, and the tower and spire are 207 feet high. Among the many monuments to famous Englishmen who have served in this country, the most conspicuous is a life-sized kneeling figure in episcopal robes by Chantrey bearing the single word 'Heber.' The spire was rebuilt in 1897, the original one having been destroyed in the earthquake of that year. 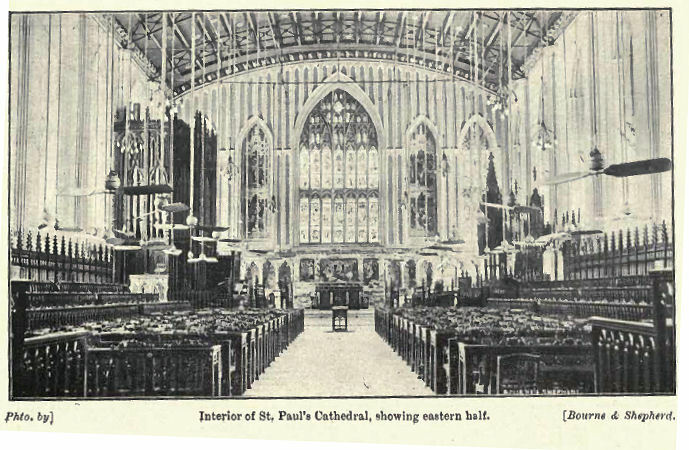 St. John's, the old Cathedral, was commenced in 1784. It was erected to replace the still older Church of St. Anne's, which occupied the site of the modern Bengal Council Chamber and was demolished by Sirāj-ud-daula in 1756. St. John's was built chiefly by voluntary subscriptions, the site being the gift of a Rājā. In the graveyard is the mausoleum which covers the remains of Job Charnock ; and slabs commemorating Surgeon William Hamilton, who died in 1717, and Admiral Watson, are built into the walls of the church. The Old Mission Church has a peculiar interest as having been erected between 1767 and 1770 by Kiernander, the first Protestant missionary to Bengal, at his own expense. In 1786 the good Swede found himself unable to defray the charges involved by his benevolent schemes, and the church was seized by the sheriff. It was rescued and restored to religious purposes by Charles Grant, afterwards the well-known East Indian Director, who paid Rs. 10,000, the sum at which it was appraised. Other churches of the Anglican communion are the Fort church of St. Peter, St. Thomas's, St. Stephen's, Kidderpore, and St. James's, besides several others belonging to missionary bodies. The Roman Catholic Cathedral, situated in the heart of the commercial quarter, was built in 1797, taking the place of a chapel built by the Portuguese in 1700. The Greek church in the same quarter was built by subscriptions in 1780, and the Armenian church was completed in 1790. At the corner of Dalhousie Square, on the site of the old Mayor's Court-house, stands the Scottish church of St. Andrew. 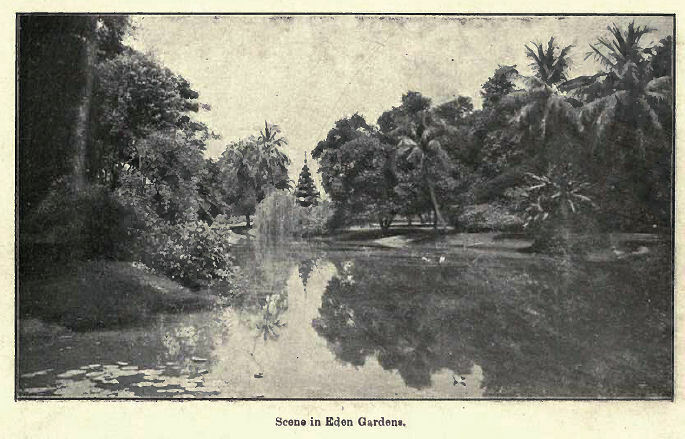 The Maidān, the chief open space in Calcutta, stretches from Government House and the Eden Gardens on the north to Tolly's Nullah on the south, Chowringhee lying on the east, and the river and Fort on the west. Scattered over it are several monuments, the most conspicuous of them being the Ochterlony column, erected in honour [S. 281] of Sir David Ochterlony, who, 'for fifty years a soldier, served in every Indian war from the time of Hyder downwards.' It rises 165 feet, with a Saracenic capital, and its summit commands a noble view of the city. Placing the river is a pillared archway erected by the citizens of Calcutta to perpetuate the memory of James Prinsep, founder of the science of Indian numismatics. Near Park Street is the fine bronze statue of Sir James Outram, in which he is represented with drawn sword looking round to his troops and cheering them forward. Among other monuments may be mentioned those of Lord William Rentinck, Lord Hardinge, Lord Mayo, Lord Lawrence, Lord Dufferin, and Lord Lansdowne ; and the equestrian statue to Lord Roberts is a noteworthy addition to this group. A statue of Her late Majesty Queen Victoria by Frampton has recently been placed on the Maidān, waiting till it may find a more honoured position in the Hall now being erected to her memory. 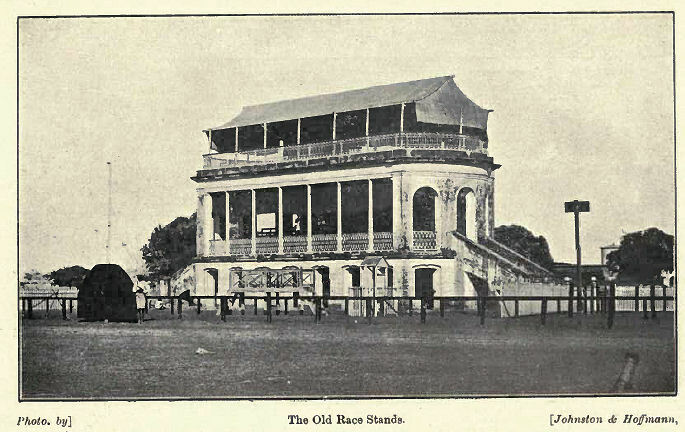 On the south-west side of the Maidān is the racecourse, while the rest of it is devoted to recreation grounds. 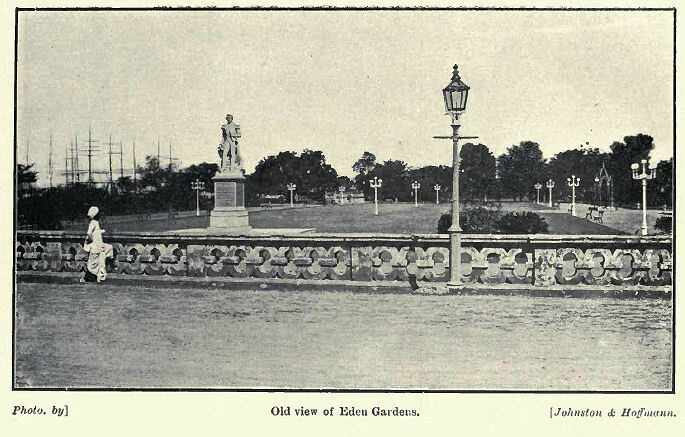 Other open spaces are the Eden Gardens, named after the Misses Eden, sisters of Lord Auckland, on the north-west of the Maidān ; Dalhousie Square, in the heart of the official quarter ; Beadon Square in the north of the town, named after a Lieutenant-Governor of Bengal ; and a series of squares by the side of Cornwallis, College, Wellington, and Wellesley Streets. 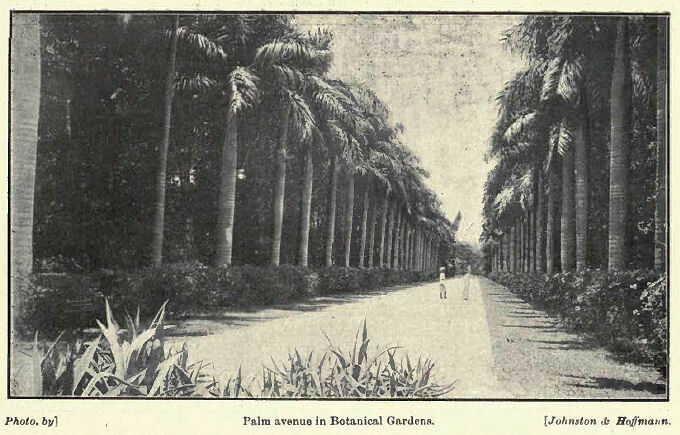 The Zoological Gardens at Alipore were opened by the (then) Prince of Wales in 1876. They are managed by an honorary committee, and are maintained chiefly by donations and subscriptions, entrance receipts, and a Government grant-in-aid. 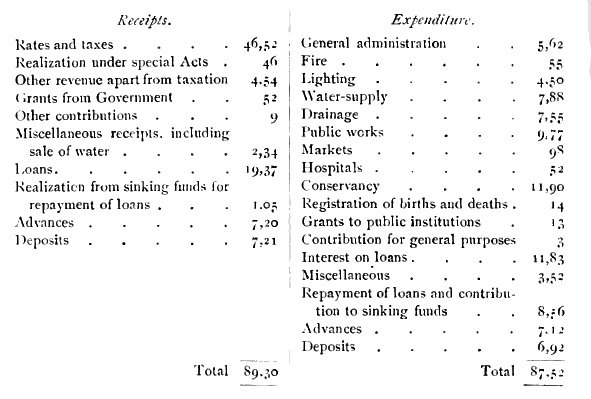 The expenditure in 1903-4 amounted to Rs. 87,000, of which Rs. 42,000 was spent on new buildings. The Government of India has made a grant of a lakh of rupees, which it has been decided to devote mainly to permanent improvements. 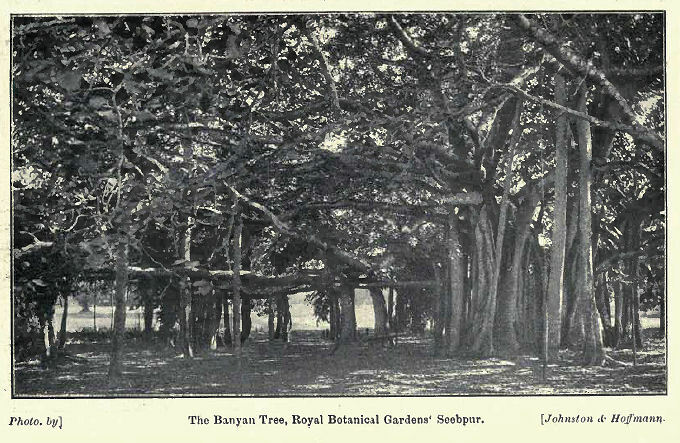 The gardens contained, in 1904, 464 mammals, 842 birds, and 238 reptiles. At Sibpur, on the opposite bank of the Hooghly, are situated the Botanical Gardens, which are beautifully laid out along the river and are stocked with rare tropical plants. They were founded in 1786, at the instance of Colonel Alexander Kyd, for the collection of plants indigenous to the country and for the introduction and acclimatization of plants from foreign parts. This object has been fully realized, and among the greatest triumphs of the gardens may be mentioned the introduction of the tea plant from China. They cover 272 acres, and contain a fine herbarium, a botanical library, and monuments to the first two Superintendents, Kyd and Roxburgh. the Eastern Bengal State Railway Volunteers, strength 728. The military authorities have control over the erection of buildings on the Maidān and in the Hastings ward, which lies to the south of Fort William. 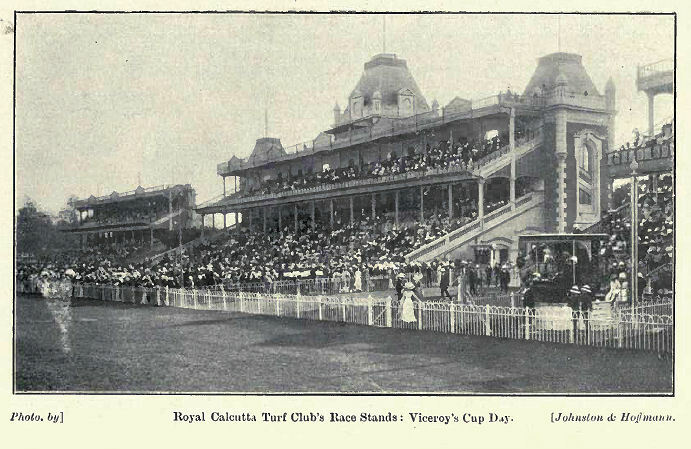 The Calcutta police force is under a Commissioner, a Deputy-Commissioner, and an Additional Deputy-Commissioner, and consists of 8 Superintendents, 55 inspectors, 74 sub-inspectors and European constables, 291 head constables and sergeants, including mounted men, 2,484 foot constables, and 130 river constables. It has under its control, besides the municipal area, the suburban municipalities of Cossipore-Chitpur, Māniktala, part of Garden Reach, and the river. There are 18 police stations in the 'Old Town' and 14 in the 'Added Area ' and in the suburbs. The total cost of the force in 1901 was 8.66 lakhs, of which 8.15 lakhs was paid from Imperial and Provincial revenues, and the rest by local bodies and private individuals for services rendered. The proportion of police to population was 1 to 405 persons, and to area 76 per square mile. Besides ordinary police duties, the Commissioner is responsible for the working of the Arms Act and the fire brigade. The latter consists of one chief engineer, 4 engineers, one European and 4 native drivers, 3 firemen, 16 tindals, 84 khalāsis, and one inspector of warehouses. The force is equipped with six steam engines and six manual engines, and is paid for partly by fees levied on jute and other warehouses and partly by certain municipalities. The number of fires reported in 1903 in the city and suburbs, including Howrah, was 120, of which only seven were serious. The Port Commissioners maintain their own boats and staff for fires on the river. Until 1845, there does not appear to have been any disciplined force, the only police being a number of thānādārs and peons for night duty ; but in that year the town was divided into three police divisions, each containing a police station with six sub-stations. In 1852 the number of divisions was reduced to two, and in 1877 the present divisions and thānās were created. By Act XIII of 1856 a Commissioner of Police was appointed, and in 1868 the detective branch was constituted. In 1867 the suburban police was made over to the Commissioner's control, Bengal Act II of 1866 having been passed for the purpose. Until 1889 [S. 283] the Chairman of the Calcutta Corporation was also Commissioner of Police, but in that year the appointments were separated. The Presidency jail on the south of the Maidān contains accommodation for 70 European and 1,214 native prisoners, the average number of prisoners during the year 1903 being 1,209. The chief industry is the printing of Government forms, and the printing work done during 1903 was valued at 1.77 lakhs; minor industries are the manufacture of mustard-oil, wheat-grinding, and carpentry. It is intended to transfer this jail to Alipore, where new buildings are being erected for the purpose. There are also a District and Central jail and a Reformatory School at Alipore, and a Criminal Lunatic Asylum at Dullunda. At the Census of 1901, 24.8 per cent. of the total population (20.9 males and 3.8 females) were returned as literate. The percentage for Christians was 75.9, for Hindus 26.5, and for Muhammadans 12.2. The University of Calcutta exercises, by means of the examinations for its degrees, paramount influence over English education throughout Bengal. The University building, situated in College Street, contains a library adorned with portraits of some of the more famous persons who have been at various times connected with the University. The higher colleges in Calcutta are the Presidency, the Doveton, La Martinière, the Free Church Institution and Duff College, the London Missionary Society's Institution, the Sanskrit College, Bishop's College, St. Xavier's, the General Assembly's Institution, the Metropolitan Institution, the City, Ripon, Central, and Bangabāsī Colleges for men, and the Bethune College for women. Of these, the Presidency, the Sanskrit, and the Bethune Colleges are Government institutions ; the first was established in 1855 and the second as early as 1824; the third was founded in 1849 by Mr. Bethune, and maintained by him till his death in 1851. It was then maintained by Lord Dalhousie until 1856, and from that date by the Government. The Doveton College was first opened in 1823 for the education of Christian boys under the name of the Parental Academic Institution ; but it was subsequently called after Captain J. Doveton, who gave it an endowment of 2.3 lakhs. La Martinière was founded by General Claud Martin, and was opened in 1836. Bishop's College was founded by Bishop Middleton in 1820, and was at first located at Sibpur on the site now occupied by the Civil Engineering College. The College of the Scottish Church was founded in 1830 and St. Xavier's in 1860. The second-grade colleges are the Madrasa, the Albert College, the Armenian College, and the Church Missionary College. The Madrasa (for Muhammadans) was founded and endowed by Warren Hastings in 1781 ; in 1873 it received additional funds from the Hooghly Muhammadan Educational Endowment, and it is also assisted by Government. The [S. 284] Armenian College was opened in 1821, and is managed by trustees. The Sibpur College for Engineering (see Howrah Town), situated on the opposite bank of the Hooghly, was opened by Government in 1880. Calcutta contains 75 schools teaching up to the standard for the entrance examination of the University, and a large number of primary schools. The oldest Christian school is the Calcutta Free School, which was founded in 1789 from the united funds of the Old Calcutta Charity and the Free School Society, which then amounted to 3 lakhs. 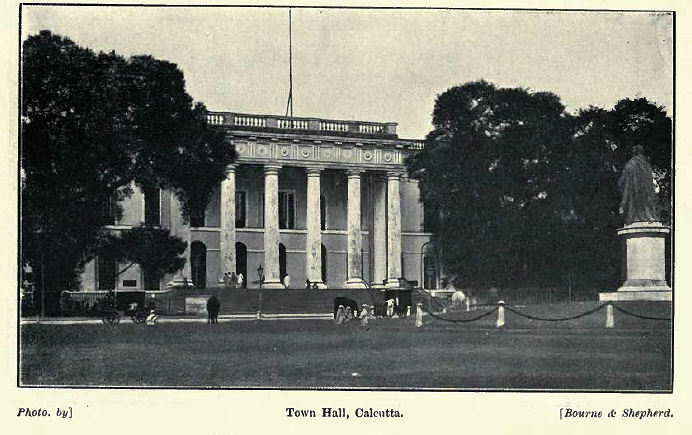 The Calcutta Medical College is a Government institution, which was opened in 1835 and had 519 pupils in 1903-4 ; there are also four private medical schools with 454 pupils. 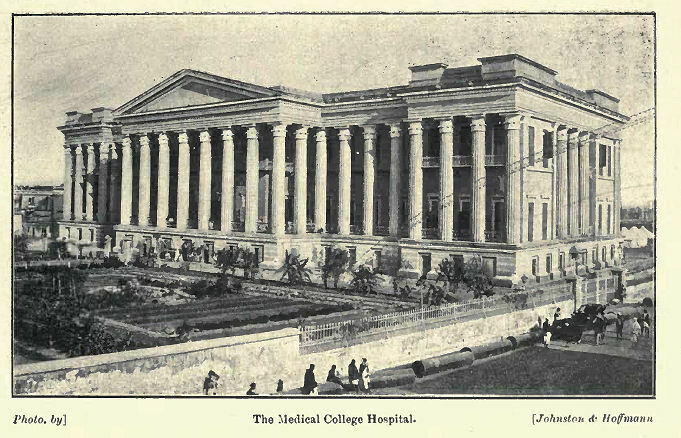 Of the latter the oldest is the Calcutta Medical School, to which the Albert Victor Hospital has lately been attached. The two most important hostels under Government management are the Eden Hindu hostel and the Elliott Madrasa hostel. The former is intended chiefly for the accommodation of such Hindu pupils of the Presidency College and of the Hindu and Hare schools as do not live with their parents or guardians ; the latter is for Muhammadans studying at the Calcutta Madrasa. In 1903-4 the number of inmates in the Eden hostel was 247 and in the Elliott hostel 222. The total expenditure of the former amounted to Rs. 30,000, and that of the latter, exclusive of messing charges, to Rs. 4,500. Of this Government paid Rs. 700 and Rs. 1,400 respectively, chiefly for medical attendance and superintendence. The average cost of a student was Rs. 10 per month per head in the former, and a little over Rs. 3 in the latter. The Government School of Art attached to the Government Art Gallery was attended by 241 pupils in 1903-4. An aided industrial school was attended by 47 pupils, and 3 unaided schools of Art taught 182 pupils. Besides, there are two schools for the blind and a deaf and dumb school. There were four training schools for mistresses in 1900-1, and one Normal school for the training of schoolmasters. In addition to the Bethune College, there were six other higher-class female institutions in Calcutta. The total number of pupils under instruction increased from 25,124 in 18S3 to 40,724 in 1892-3 and to 43,979 in 1900-1, while 39,524 boys and 8,277 girls were at school in 1903-4, being respectively 46.8 and 19.3 per cent. of the total of school-going age. The number of educational institutions, public and private, in that year was 531, including 20 Arts colleges, 69 secondary, 311 primary, and 131 special schools. The expenditure on education was 18.06 lakhs, of which 6.22 lakhs was met from Provincial funds, Rs. 11,000 from municipal funds, and 8.16 lakhs from fees. Calcutta has four daily newspapers owned and edited by Englishmen : [S. 285] namely, the Englisman, the Indian Daily News, the Statesman, and the Empire, the latter being an evening newspaper which has recently (1906) been started. The other journals and magazines under European management include a fortnightly illustrated paper, a weekly paper dealing with finance and commerce, an illustrated engineering journal, and three weekly papers devoted to sport. Other periodicals deal with religious subjects, the interests of planters and volunteers, medicine, railways, horticulture, and literary and general matters ; one of the latter, the Calcutta Review, is an old-established publication of some repute. There are also five daily newspapers published in English but owned and edited by natives : namely, the Bengalee, Amrita Bazar Patrikā, Indian Mirror, Hindoo Patriot, and Bande Mataram. No less than twenty-three vernacular papers are published in Calcutta, but few of these are daily journals or of any great importance ; the most influential are the Hitabādī, the Basumatī, and the Bangabāsī, all weekly papers. The chief hospitals are the Medical College, Eden, Ezra, Syāma Charan Law Eye, Presidency General, Campbell, Police, Sambhu Nāth Pandit, and Dufferin Victoria Hospitals, the Mayo Native Hospital with three dispensaries and the Chandney Hospital attached to it, and the Kidderpore Municipal and Dockyard Dispensaries. Of these, the Dufferin Victoria Hospital and the Eden Hospital are for women only. The Medical College Hospital was originally started in 1838 with thirty beds. It was very largely attended and, the accommodation having soon been found quite insufficient, an enlarged building was opened on the present site in 1852. The Eden or lying-in Hospital, the Ezra Hospital for Jews, and the Eye Infirmary were subsequently added to it. The Presidency General Hospital for Europeans dates from about the middle of the eighteenth century. The central block was purchased by Government in 1768, and two wings were added in 1795. The foundation stone of a new block was laid in 1898. This is one of the best hospitals in India ; it contains accommodation for 233 patients, and has been provided with all modern requirements and conveniences. The Campbell Hospital, started in 1867, is the largest hospital in India and has accommodation for 752 patients. The Police Hospital, with 211 beds, was opened in 1865 for the treatment of the members of the Calcutta police. The Mayo Native Hospital, the successor of the old Chandney Hospital, contains 105 beds and was opened in 1874. The total number of patients treated in these institutions during 1903 was 274,000, of whom 25,000 were in- and 248,000 out-patients. Of these 163,000 were men, 51,000 women, and 59,000 children. These charities are mainly dependent on Government for their support. In 1903, out of a total income of 9.15 lakhs. Government gave 6.39 lakhs; 1 lakh was supplied from Local funds ; the Corporation contributed Rs. 46,000 ; [S. 286] interest on investments amounted to Rs. 25,000 ; while only Rs. 7,000 was subscribed, the balance being made up from fees from paying patients. There are also two Lunatic Asylums entirely under Government control, while a Leper Asylum has lately been erected. Vaccination is compulsory, and is controlled by the Health department of the Corporation. In 1903-4 the number of persons successfully vaccinated was 22,492. Calcutta, South Suburbs.—Town in the head-quarters subdivision of the District of the Twenty-four Parganas, Bengal, comprising a portion of the southern suburbs of Calcutta. Population (1901), 26,374, of whom 20,165 were Hindus, 5,849 Musalmans, and 350 Christians. 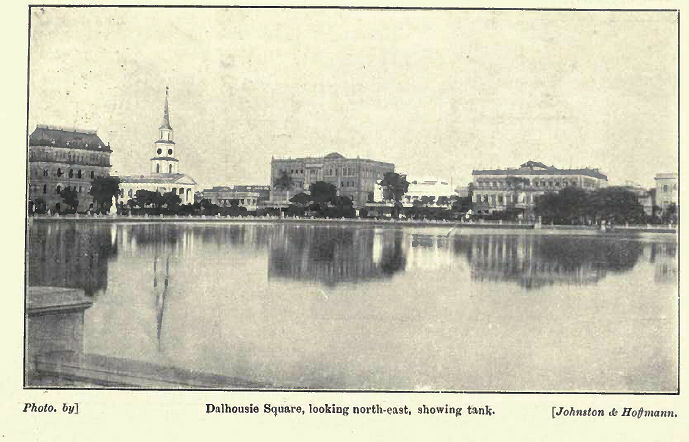 The application of the term 'suburbs of Calcutta' has varied widely at different periods. By Act XXI of 1857 the 'suburbs' were defined as including all lands within the general limits of the Panchānnagrām estate; and under the Bengal Municipal Act, 1876, they were further defined as comprising the present municipalities of Cossipore-Chitpur, Māniktala, Garden Reach, South Suburbs, and Tollygunge, as well as so much of Calcutta as lay outside the limits of the 'Old Town,' which was bounded by Lower Circular Road and Tolly's Nullah. This unwieldy municipality, known as the Suburban municipality, was in 1888 split up into four parts, the 'Added Area' and 'Fringe Area Wards' (defined in article on Calcutta) being added to Calcutta, and the municipalities of Cossipore-Chitpur and Māniktala being created. These deductions still left the South Suburban municipality of unmanageable size, and, accordingly, in 1897 the Garden Reach municipality and in 1901 the Tollygunge municipality were separated from it. The constitution of the present 'South Suburbs' municipality therefore dates from 1901. The income during the three years following its constitution has averaged Rs. 52,000, and the expenditure Rs. 32,000. In 1903-4 the income was Rs. 79,000, including Rs. 11,000 derived [S. 287] from a tax on houses and lands and Rs. 29,000 obtained from the saleproceeds of Government securities and the withdrawal of savings bank deposits. The expenditure in the same year was Rs. 52,000, of which Rs. 29,000 represented the outlay on the introduction of a supply of filtered water. The principal villages now within the municipality are Barisā and Behāla. Calcutta and Eastern Canals.—A system of navigable channels in the Twenty-four Parganas, Khulnā, Backergunge, and Farīdpur Districts of Bengal and Eastern Bengal and Assam, extending over a length of 1,127 miles, of which 47 miles, including Tolly's Nullah, are artificial canals, and the remainder are natural channels, mainly tidal creeks in the Sundarbans. These stretch eastwards from the Hooghly across the Ganges delta and afford means of intercommunication between the mouths of the latter river. The channels are under the supervision and control of Government, and tolls are charged on vessels using the artificial canals. This is one of the most important systems of river canals in the world, judged by the volume of the traffic, which averages 1,000,000 tons per annum, valued at nearly four millions sterling. 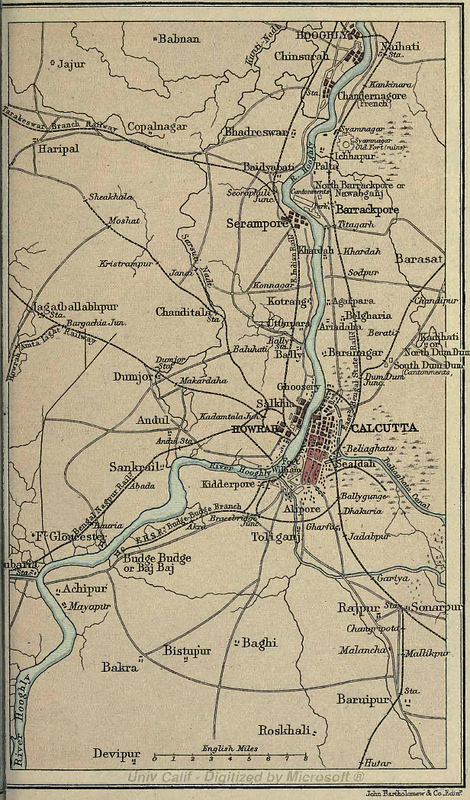 The situation of Calcutta makes it the natural outlet for the Ganges valley ; and this position has been enormously strengthened by the construction of railways, but other measures were necessary to enable it to tap the trade of the Brahmaputra valley and to focus the rich traffic of the eastern Districts. The intermediate country is a maze of tidal creeks, for the most part running north and south but connected here and there by cross-channels, wide near the sea-face but narrow and tortuous farther inland. These inland channels are constantly shifting as the deposit of silt raises their beds, while on the other hand the great estuaries near the sea-face are not navigable by country boats from June to October, owing to the strong sea-breezes which prevail during the south-west monsoon. This system of canals was devised, therefore, in order to allow country boats to pass from the eastern Districts to Calcutta by a direct inland route, and the problem has been to keep the natural cross-channels clear of silt, and to connect them with each other and with Calcutta by a system of artificial canals. The channels have been in use for many years ; and it is along them that the rice, jute, and oilseeds of East and North Bengal, the tea of Assam and Cāchār, and the jungle produce of the Sundarbans pour into Calcutta, while they also carry the exports of salt, piece-goods, and kerosene oil from Calcutta to those Districts. Before the opening of Tolly's Nullah, boats could approach Calcutta only by a route close to the sea-face which brought them into the Hooghly by the Bārātala creek, 70 miles below Calcutta ; and this route was not only circuitous but was impracticable for country boats during [S. 288] the rainy season. The pioneer of the system was Major Tolly, who in 1777 canalized an old bed of the Ganges, from its confluence with the Hooghly at Hastings, a little south of Fort William, in Calcutta, south-eastwards to Gariyā (8 miles). From this point the canal (known as Tolly's Nullah) was carried east to meet the Bidyādharī river at Sāmukpotā, and thus gave access to an inner route which leads eastwards from Port Canning. 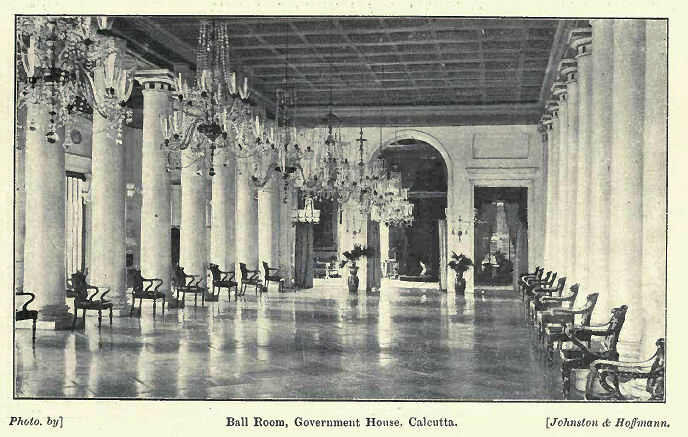 In 1810 a further step was taken to facilitate access to Calcutta. An old channel through the Salt Water Lakes, east of the city, was improved and led westwards by what is now known as the Beliāghāta canal in the neighbourhood of Sealdah. Between 1826 and 1831 a new route was opened between Calcutta and the Jamunā river, following, the same direct easterly course as the present Bhāngar canal, the object being to relieve the pressure on Tolly's Nullah ; a number of tidal channels were utilized and connected by six cuts to form a continuous eastward route. The next step was to cut the Circular canal from Chitpur, parallel with the Circular Road, to meet the old Eastern canal at Beliāghāta, and this was completed in 1831. These canals were still choked by the increasing stream of traffic ; and, in order to relieve them, the New Cut was opened in 1859, leading from Ultādānga, a point on the Circular canal 3 miles east of Chitpur, south-east to Dhāpa on the Beliāghāta canal. Finally the Bhāngar channel was canalized in 1899 for a length of 15 miles, thus completing the inner channel which had been commenced in 1831. The objective of this system is Barisāl, the head-quarters of the great rice-growing District of Backergunge, situated 187 miles east of Calcutta. There are three alternative routes to Barisāl. The one generally followed is along the Bhāngar canal and Sibsā river to Khulnā, and thence by the Bhairab river to Pirojpur and Barisāl. An alternative route between Calcutta and Kālīganj on the Ichāmatī river follows Tolly's Nullah and the Bidyādharī river to Port Canning, and then strikes north-eastward. This is called the Outer route, and two similar alternative routes branch off southwards in Khulnā District. The main steamer route follows the Hooghly river as far as the Bārātala creek, and then turns east and north-east, meeting the two routes previously described at Pirojpur. Included in this system is an important channel, known as the Mādarīpur Bīl route, which connects the Kumār and Madhumatī rivers, and is used by jute-laden steamers during the rains ; it shortens the journey between Khulna and Mādarīpur by 89 miles. The construction of this route was commenced in 1900, and has since been completed. The channel is being deepened and widened for the purpose of allowing steamers and flats drawing 6 feet of water to use the route during the jute season ; and the question of still further improving it, so as to make it navigable throughout the year, is under consideration. The net [S. 289] revenue of these canals in 1902-3 was 1.4 lakhs, being 2 per cent. on the capital outlay, and the estimated value of cargo carried during the year was 497 lakhs. In 1903-4 the receipts amounted to 4 lakhs and the net revenue was 1.3 lakhs; while the total capital outlay up to March 31, 1904, was 77.1 lakhs.